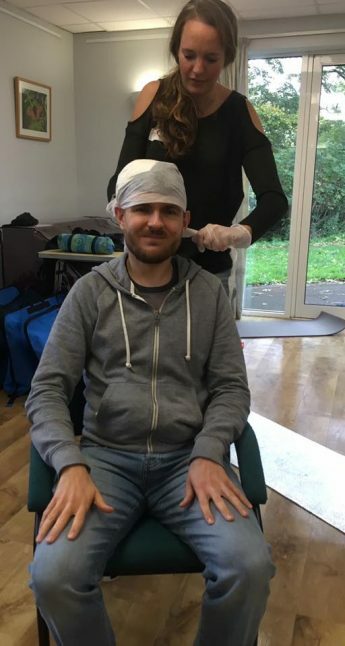 On a rather wet and windy weekend in October 22 AMC members took part in subsidised training courses in the South West and South Wales. 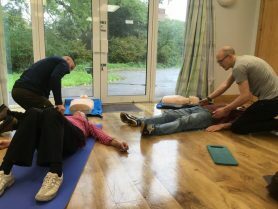 This year the club invested money in our members to help increase our knowledge and experience and develop members skills, particularly around safety. 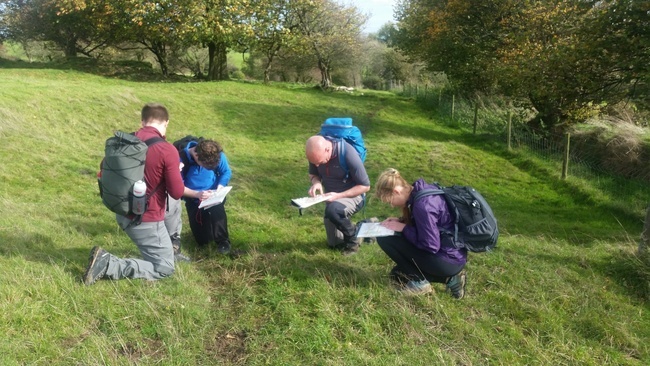 Courses were provided in navigation – for beginners, intermediate and night navigation – and First Aid. A round up of the weekend follows. Three separate navigation courses were provided by Dave and Mark of Dave Talbot Adventure Events. As Dave said, the importance of navigation is easily forgotten about by most folk in the hills. Having the ability to read a map well helps with route planning for adventures like cycling, running, climbing and other outdoor sports. 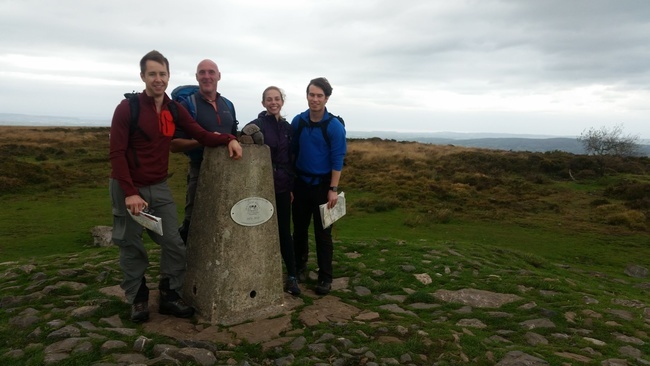 Jane, Dave, Sam and Sam headed down to the Mendips on Saturday morning to meet Dave the instructor for a day out and about in the hills. The group spent the day learning the fundamental skills of navigation, map setting, interpreting scales, bearings, pacing, timing, using contours and how to keep track of where you are and building confidence. The two other courses took place in the Black Mountains. Due to the soggy and windy forecast, both groups headed to an outdoor education centre just outside Hay on Wye for some ‘dry’ instruction before heading out into the hills to put it into practice. 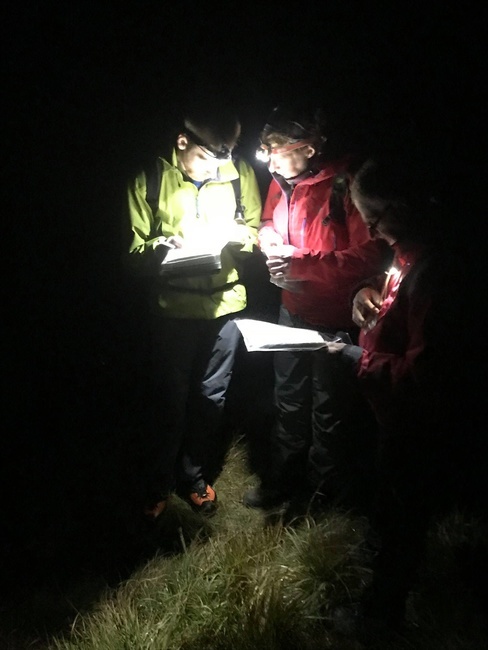 Saturday night was wet and windy and up on the ridge between Hay Bluff and Twmpa (Lord Hereford’s Knob) there was little option to hide from the elements providing a bigger challenge at the start of the evening for Al, Becky and Julian. The evening had them working on their skills with relocation exercises, rucksack location and learning more advanced search skills when one rucksack was not easily found. Mark the instructor took them on a gaunt all over the hills, but even he had to admit to wearing double gortex layers to keep dry! The evening finished at around 11pm, after a sightly odd spectacle of a firework display followed by helium balloons appearing in the night sky high above the mountains. Lessons were learnt and the importance of not only skills and knowledge but having good kit was definitely put to the test. The intermediate navigation courses headed up to the same area on the Sunday with Ellie, Sarah and Nigel enjoying a slightly less wet but equally windy day. Mark again provided an excellent days tuition with many hours spent out in the hills building on existing navigation knowledge, developing compass work and relocation skills, feature and contour interpretation, micro nav and improving timing and pacing and looking at the different maps used in the UK. 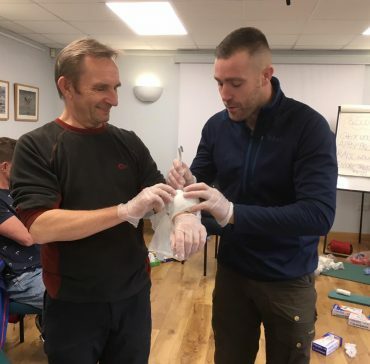 The course was designed specifically to cover 1st aid in the environments that as climbers and mountaineers we frequent – often remote, exposed to the elements and with potentially no phone signal or others around to help. 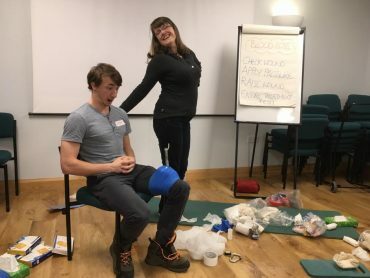 When discussing the course with Louise, we had our ideas of what we wanted to learn – definitely not a 1st aid at work course – and Louise delivered everything and more. 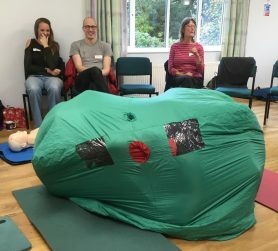 The course was a full on day for all involved, with lots of practical involvement for all on the course. 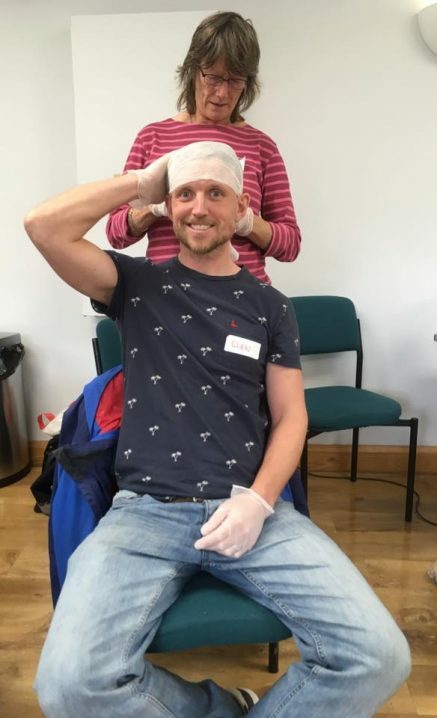 There were plenty of opportunities to get ‘hands on’ to put into practice what we’d learned. During the course of the day, unexpected hidden acting talents, and hidden tickle spots were uncovered! 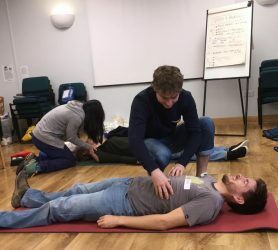 The AMC will be supporting more members in 2019 with further subsidised courses. Look out for emails if you’re interested in taking part. How many people can you fit in a 2-3 man shelter? 4 apparently!